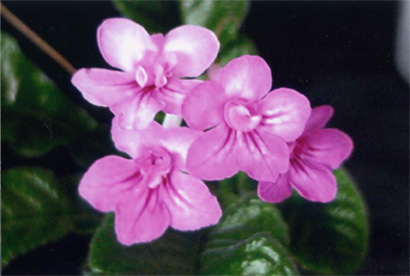 Streptocarpus ‘Fernwood’s Bam Bam’. 2006, IR06985, L. Stradley, NY. ( ‘Bristol’s Lily White’ x ‘ Little Gem’). Date of cross, planting and first flowering unknown. Fertile but reproducible only vegetatively. Rosette. Leaves green, 6-8 in. long x 1-2 in. wide, linear with serrate margin and acuminate tip. Calyx split, green, 1/8 in. long. Peduncle 5-6 in. tall with 5 to 8 flowers. Corolla salverform, 1 in. long x 1 in. wide, double, pink and white with fuchsia veins on lower three petals and a splash of yellow in center.